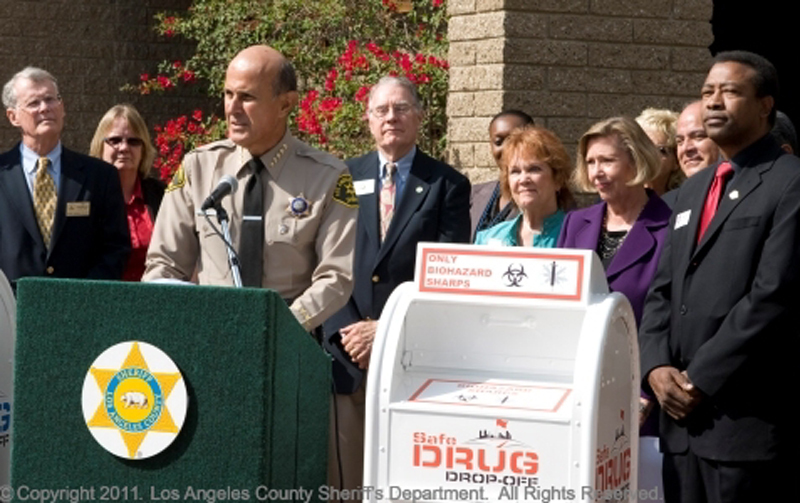 SCV residents are encouraged to bring unwanted prescription drugs to the safe, anonymous drop-off box in front of the Santa Clarita Valley Sheriff’s Station at the corner of Valencia Boulevard and Magic Mountain Parkway “today or any day, 24 hours a day, seven days a week” – or during Saturday’s nationwide event. [DEA] – With public participation at an all-time high after four prior events in two years, the Drug Enforcement Administration (DEA) and its national, tribal, and community partners will hold a fifth National Prescription Drug Take Back Day at thousands of sites across America on Saturday the 29th. These Take Back Days give the public the opportunity to prevent pill abuse and theft by ridding their homes of potentially dangerous expired, unused, or unwanted prescription drugs. Collection sites are open 10 a.m. to 2 p.m. local time. The service is free and anonymous, no questions asked. Americans participating in DEA’s four previous Take-Back Days turned in nearly 1.6 million pounds—almost 774 tons—of prescription drugs, most recently at almost 5,700 sites operated by nearly 4,300 of the DEA’s local law enforcement partners. DEA’s last event collected more than double the pills as their first event two years ago, with almost 50 percent more participating agencies and sites this past April than in September of 2010. Medicines that languish in home cabinets create a public health and safety concern because they are highly susceptible to diversion, misuse, and abuse. Rates of prescription drug abuse in the U.S. are alarmingly high–more Americans currently abuse prescription drugs than the number of those using cocaine, hallucinogens, and heroin combined, according to the 2011 National Survey on Drug Use and Health. Studies show that a majority of abused prescription drugs are obtained from family and friends, including from the home medicine cabinet. The public can find a nearby collection site by visiting www.dea.gov, clicking on the “Got Drugs?” icon, and following the links to a database where they enter their zip code. Four days after DEA’s first Take Back event two years ago, Congress passed the Secure and Responsible Drug Disposal Act of 2010, which amends the Controlled Substances Act to allow an “ultimate user” of controlled substance medications to dispose of them by delivering them to entities authorized by the Attorney General to accept them. The Act also allows the Attorney General to authorize long term care facilities to dispose of their residents’ controlled substances in certain instances. DEA is in the process of drafting regulations to implement the Act. The National Take Back Day effort saves lives. Too many kids experiment with pills, and that can quickly lead to addiction. Opiate abusers ultimately turn to heroin. We’ve lost too many lives in America from either pills or heroin. Teen addicts in treatment tell Myteensavers that they never thought their recreational pill use would lead them to heroin, but it did. They advocate frequent parental conversations and home drug testing to help detect early drug use.